Muriel (Toni Collette) is not the leading lady of her own life. An unemployed young woman who graduated from a two-year secretarial course without typing skills, she spends her days in the dreary tv-centred home of her family and on the outskirts of the social life of the 'in crowd'. Of couse in Porpoise Spit the in crowd are big-haired and small-brained and class-less. Muriel's father (Bill Hunter) is the big kick-back taking fish in the local pond, her mother is a washout making microwave tea in the kitchen and her siblings are similarly unemployed tv junkies. Into this life comes a blank cheque destined for the hands of a local woman with a suspicious friendship with Muriel's dad. Now is Muriel's opportunity to dance. She sees herself in the mirror through a maze of wedding dress photos and she judges her life against the bright, rhyming music of ABBA. Suddenly she has the friendship of the outrageous Rhonda (Rachel Griffiths) and a chance to put on an ABBA jumpsuit and make a noise for herself. Muriel is awful, she has inherited her father's loose moral code and makes her new life in Sydney with Rhonda at the expense of the family chequing account. 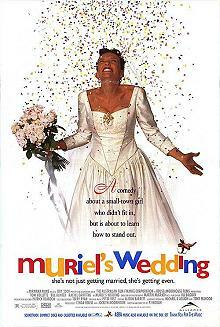 Muriel's Wedding is a charicature of Australian life, a little too weird mob to be enlightening, but P.J. Hogan's script has its twists and the ending is a satisfying turn in the road.